Hello all! Did you enjoy an extra hour this morning? One more hour to make cards, right? Haha! If you haven’t seen it yet, be sure and check out the new monthly challenge from Our Daily Bread! This month it is love cards. Maybe you can use this sketch to create a beautiful love card for one of our heroes to send home! 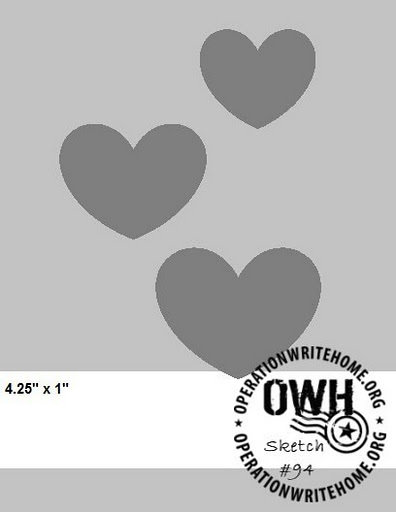 Quick reminders: all our OWH sketches are designed for our preferred card size of 5.5″ x 4.25″ (A2 size) and the heart symbol on the sketch indicates the embellishment of your choice, it doesn’t have to be a heart. Our samples for this sketch were made by the awesome Seongsook! I’m sure you’ve seen her name before in our bloghops, other challenges, and on our Facebook page. She also has a blog called Seongsook’s Creations. Be sure and stop by to see more of her work and say hello. Thank you for the beautiful sample cards, Seongsook! There you go, folks, go get started on some beautiful cards! Be sure and come back here to link up your work. I love visiting your blogs each week and I hope you visit the others that link up. To play along in this week’s sketch challenge, simply upload a project using this week’s sketch to your blog or online gallery then leave the link to that entry using the Inlinkz widget at the bottom of this post. And remember, you may use this sketch at any time. Feel free to re-post the sketch on your blog along with your card… then come back and leave a link for us so we may all see your cards! This is a great sketch and your samples are so diverse. I love the color you chose in the last card. Thanks for sharing. These samples are exceptional. Than you, Seongsook, for the inspiration. Your cards are all great. I love the way you showed the flower from 3 different perspectives on the last card. 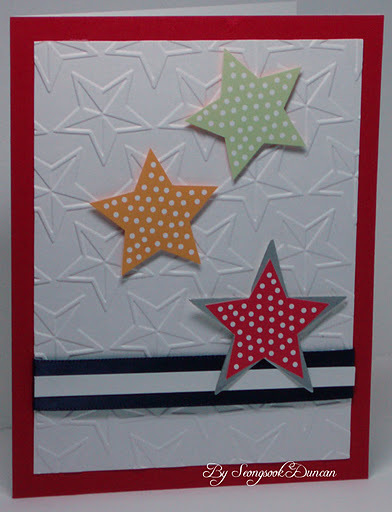 I also like the embossed background with the polka dot stars on the first card. I think this qualifies as a polka dot card a guy can feel comfortable using! Your cards are all beautiful Seongsook, but the one with the flowers is my favorite! 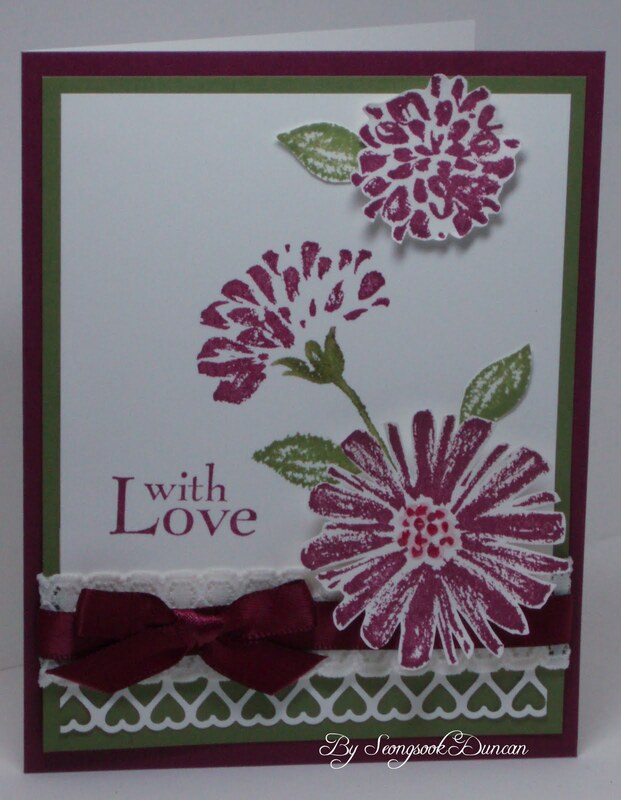 I Love the colors and tiny hearts border! Wow!! I love the wonderful inspiration provide by Seongsook! Her cards are always AWESOME! !Another fun sketch and I hope to work on my card shortly! !Yes…I loved the extra hour of sleep, but I know I won't LOVE it being dark at 4:30 this afternoon. I'm a Summer girl, who does not LOVE winter!! I hope it flies BY! !Happy Sunday and Happy Crafting!! Great diversity in the samples. They are all so nice. My favorite is the last I love the dimension and the different stamps. Thank you for sharing and inspiring. 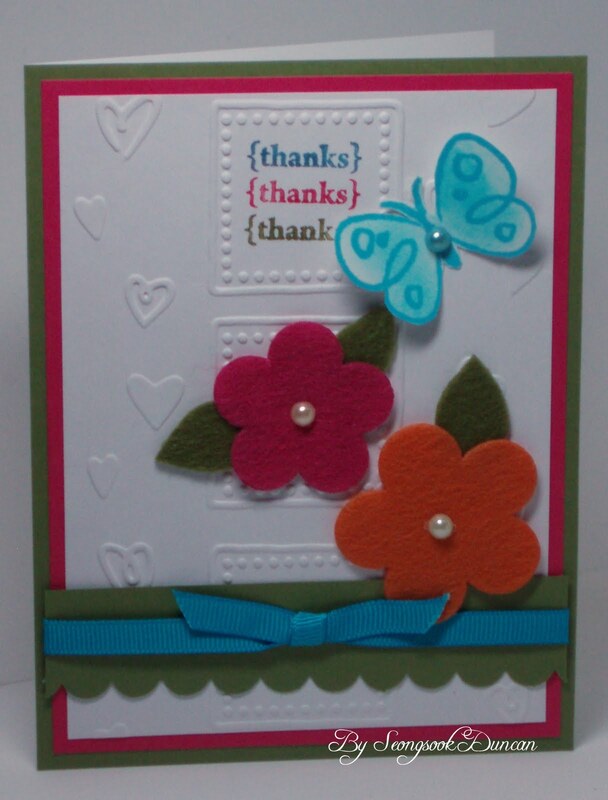 You make such beautiful cards and are an inspiration. Thank you so much for sharing. OMGosh what wonderful creations! Thanks for the great inspiration. At first glance this sketch looked intimidating but seeing how Seongsook interpreted it in these beautiful samples really helps to spark a variety of ideas. Great work Seongsook! I totally agree with Paula about the sketch being intimidating! I know they are to be followed, not exactly, but enough to know they are that sketch. I am one of those who follows the sketches very closely, and now, with Seongsook's help, I am going to be able to grow more as a cardmaker! Thank you so much Seongsook; your cards are awesome. I like every one! Lisa the date had been set wrong on the Inlinkz – works n ow! Thanks so much! I have now added my card, which I have since also revised! :)Having the extra time was a plus and I'm much happier with the updated version! Love these cards. I have the embossing folder and the Stars stamp on the firs card. Will definitely be casing this one.